Remember when Stephen Wiltshire visited Houston to draw his panorama of Houston? His Houston panorama is being installed at Houston City Hall. On his last day in #Houston, Stephen Wiltshire tours the city - on the ground this time - in a stylish vintage 1964 Buick Electra convertible, courtesy of Weingarten Art Group friend Phillip Winston. It also happens to be Stephen's birthday today! Happy birthday, friend! Absolutely charming photos from Day 5, the finale! Photos by Morris Malakoff Photography and Meilin Hyde. Watch the video here. Hello from your social media team! It's been a pleasure being your liaison to Stephen Wiltshire's Houston adventure. Alongside photographer/videographer Morris Malakoff, expect more photos and a few more videos chronicling the #elevatehou finale. And yes, that's our guest wearing a token of Texas hospitality. Stephen Wiltshire shows us just how much parkland and green spaces #Houston? has. In this last day, he will finish the #elevatehou panorama. Stay tuned for culminating festivities! The live public art performance will be held in Galleria IV Level One between Macy's and Nordstrom. Free parking is available in the Red Garage, accessible from McCue Road near Hidalgo Street, Hidalgo Street near McCue Road, and McCue Road near West Alabama Street. Where did Stephen Wiltshire take us today? Where did Stephen Wiltshire take us today? Across a wide range of scenery, including homes, commercial areas and many parks and trees. One more day to go! Photos by Morris Malakoff, Joel Luks and Meilin Hyde. Day 4 and two days to go: Stephen Wiltshire is heading further west and south. We can see NRG Park and we're heading . . . ? Stop by to find out! The live public art performance is being held in Galleria IV Level One between Macy's and Nordstrom. Stephen Wiltshire Day 3: We have Houston! Lots of school groups stopped by today to take a look at Elevate Houston with artist Stephen Wiltshire's progress. Education coordinator Debra Barrera led several students through a guided discussion on art, talent and abilities. You might see yourself in these photos! An adventurous day for Stephen Wiltshire on day two of #elevatehou included a visit from Inside Edition and the continuation of his drawing, from downtown to the west. Take a good look: What do you recognize? Inside Edition executive producer Chris Dukas visits Elevate Houston with artist Stephen Wiltshire for a special feature on people with extraordinary abilities to air in May. It all began with an empty canvas, a 3 by 12 foot promise of what Stephen Wiltshire had the power to deliver. And that he did, working his way from downtown to bayous, and east and west. Can you recognize some of the landmaks? Like Buffalo Bayou Park? Yes, rumor has it that Stephen Wiltshire is quite fond of what's going on with Houston tacos. Perhaps there's a bit of Texas in our guest of honor? Read this feature on CultureMap about his visit to the Bayou City, the ride on Tilman J. Fertitta luxury chopper plus his adventure aboard Apex Helicopters. Day 1 of 5: Stephen Wiltshire's drawing will begin today! Our guest will continue to create his Houston panorama everyday from 10 am to 5 pm, with a break from 1-2 pm, at The Galleria. Guess what just happened? Thank you Tilman J. Fertitta for graciously sponsoring Stephen Wiltshire's tour of #Houston?! Stay tuned for exclusive footage! #elevatehou? Because daring to dream is more courageous than justifying what we think is real. Stephen Wiltshire's journey teaches us to see beyond what we think we can do. ?#?elevatehou?. Welcome to Houston Stephen Wiltshire! You're going to love Houston and Houston is going to love you! #elevatehou? In other words: You could be your own best friend or your most critical adversary. It's up to you. #elevatehou?. How does Stephen Wiltshire's journey inspire you to elevate yourself? Tell us in the comments. A wonderful draftsman: But has Stephen Wiltshire ever "snuck" anything unexpected into his drawings? Lea Weingarten, firm principal of the Weingarten Art Group, keeps a close eye on the international pulse of contemporary art. As a leading art consultant based in Houston and New York, Lea is called upon frequently to curate and project manage engaging public art installations that contribute to Houston's transformation as a city that values creativity, entrepreneurship and innovation. The Elevate Houston: The Big Picture featuring British artist Stephen Wiltshire project was born out of that desire. What does Lea think about the Bayou City and Stephen? Read on to find out. Q: What about Stephen Wiltshire fascinates you most? Lea Weingarten: What fascinates me most about Stephen is his focus on his artistic talent and sensibility, not on obstacles. He is a wonderful draftsman! Q: When you tell travelers about Houston, what's the first thing you mention? Lea Weingarten: I tell them that Houston is one of the best kept cultural secrets in the U.S. Not only do we have our own ballet, symphony and multiple theaters, we are also home to numerous museums, the Rothko Chapel and tremendous green spaces that are now being activated by multiple public art programs! We are no longer the stereotypical southern city - we are international, diverse and very hip. Q: Do you have a unique talent that not many know about? Lea Weingarten: Well, nothing nearly as impressive as Stephen. I do have a brain wired for languages. At one time, I was proficient in five, now it is closer to four. Q: What Houston building or landmark would you like to see included in Stephen's drawing? Lea Weingarten: I look forward to Stephen's inclusion of our bayous in his drawing. These features DEFINE our city in so many important ways. For me, they are connectors - both physically and spiritually for Houston. Q: If you could ask Stephen any one question about his work/talent, what would it be? Lea Weingarten: I would ask him if he has ever "snuck" anything unexpected into his drawings to see if anyone noticed - perhaps the Queen? Or one of his favorite vintage cars? Patron and faithful art supporter Michael Dokupil, principal of SFC Capital Management, an investment management company, shares his thoughts about Stephen Wiltshire's appearance in Houston on April 19-23 at The Galleria, and what it means for the city as a whole. Q: When did you first become aware of Stephen Wiltshire's work and talent? What was your initial reaction? Michael Dokupil: I first saw a 2008 BBC documentary on Stephen's drawing abilities. I was completely impressed and thought he should draw Houston and every other major city. Q: What made you decide to support bringing Stephen to Houston to realize one of his signature panoramas? Michael Dokupil: I think of Houston as one of the great global cities, and I think it is important to have Stephen fully document its current state of development. I'm a lifelong Houstonian and have seen it grow tremendously over the years. I look forward to seeing the city evolve and having a point in time to look back on with the panorama. Q: Finish this sentence: A drawing of Houston wouldn't be complete without . . . Why do you feel that way? Michael Dokupil: Everything! I wish it could cover the entire metro area from Galveston to The Woodlands to Sugar Land and the Ship Channel. I'm very curious to see what Stephen chooses to include and not include. It's not a photograph; it's an artist's drawing. Q: What's the most rewarding part of supporting artistic and creative endeavors such as this one? Michael Dokupil: I sit in front of a computer screen every day at work. Though I enjoy it, it is fun to see something tangible get made in the real world. Q: What do you hope people learn, take away or remember from this project? Michael Dokupil: I really hope that people take away from this that they are only limited by their imaginations and willingness to put forth work. I've looked at the evolution of Stephen's drawings from when he was a child. Although he is amazingly gifted through tremendous effort, he has gotten much, much better over time. And I hope people just enjoy it. I can't wait to watch! "Every aspect of what he sees comes alive on paper. It's purely Stephen's determination that he is where he is today," - Annette Wiltshire, Stephen Wiltshire's sister. In 8 days, Elevate Houston with artist Stephen Wiltshire kicks off at The Galleria! Reminder of the dates? April 19-23. Dreaming, whether literally or metaphorically, allows all of us to gain excitement over limitless possibilities. Filmmaker Akira Kurosawa said it beautifully in this quote. "Stephen is an exceptional talent, he has great integrity, he has a questioning mind, and he works with passion and energy," - Ben Johnson, artist and friend. Surely something we learn from watching Stephen Wiltshire work, his ability to see and synthesize beyond most. Recognize the Houston iconic building pictured here? #elevatehou? Houston has been called "the town that built the port that built the city." Throughout its history, whenever the Houston Ship Channel has grown, Houston has grown. The Houston Ship Channel is an economic engine that produces jobs and economic prosperity for the local and state economy. How will this local landmark be interpreted by Stephen Wiltshire? Be sure to visit The Galleria April 19-23 to find out! #elevatehou? While we've been highlighting lots of iconic Downtown Houston architecture ahead of Stephen Wiltshire's visit, let's remember that equally important to Houston's landscape is the beautiful Buffalo Bayou Park. Will this make it into Stephen's drawing when he draws from memory at The Galleria on April 19-23? Yes, we agree. Life is one panoramic landscape. Local Houston Magazine writes: "If that's now awe-inspiring, I don't know what is. I LOVE Stephen Wiltshire's passion to have found light..."
It's happening soon! We're 19 days away from Stephen Wiltshire's appearance at The Galleria from April 19-23 to draw Houston's cityscape as part of the #elevatehou? project. Do your friends know? Don't you think they should? Please share this page with them! When 717 Texas achieved certification at the Platinum level under the USGBC's LEED rating system for Existing Buildings (EB), it was the first skyscraper in Texas to achieve the highest green building designation. This building, developed by Hines, adds a striking component to Houston's skyline. 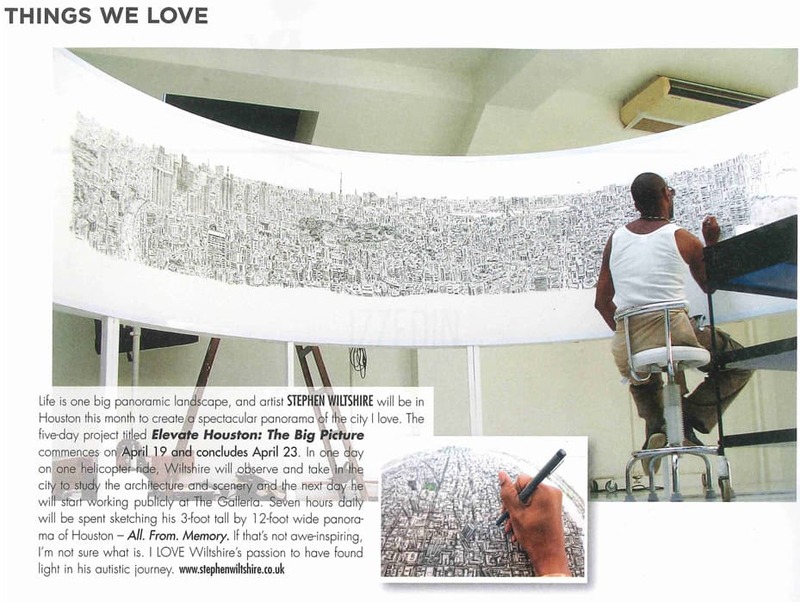 But will it show up in Stephen Wiltshire's Houston drawing? Now we just have to wait till April 19-23 to find out! ?#?elevatehou? 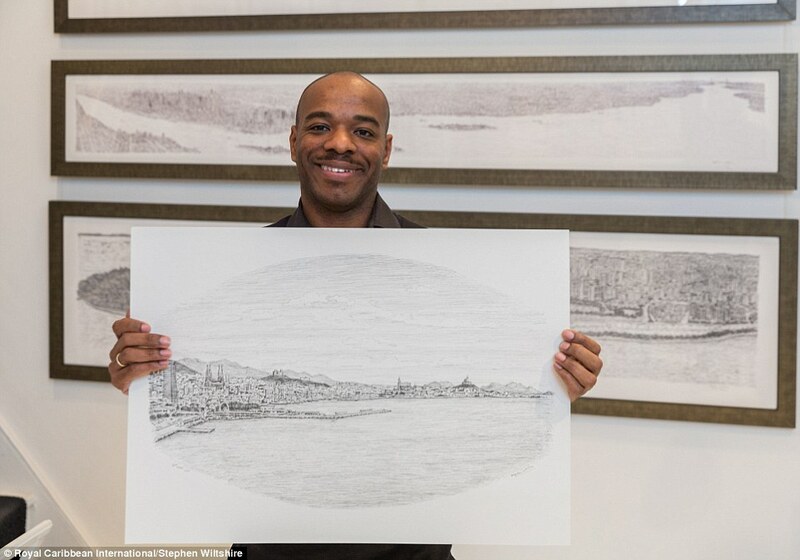 "I think it all comes down to Stephen Wiltshire's desire to express himself in a grander way. These big pieces expand him and his identity. It also expands his vision. And the very nature of these very panoramic views would suggest to me that here is someone who has a bigger view of things," Michael Vincent, a friend on Stephen's panoramic sketch of London, all executed from memory. When Houston Industries Plaza opened in 1974, the building stood at 651 feet tall. After a 1996 renovation, what's today known as the CenterPoint Energy Plaza designed by Richard Keating was extended by 90-feet, adding a dramatic element to Houston's skyline. Will the CenterPoint Energy headquarters be included in Stephen Wiltshire's Houston drawing? Time will tell. "He's passionate, this is his life. We need air and water and food to eat. Stephen Wiltshire needs pen and paper to keep him going, this is what he needs to keep him going. It's what his dream is," - Annette Wiltshire, Stephen's sister. Albert Memorial in progress, photo courtesy of The Stephen Wiltshire Gallery. Stephen Wiltshire's process is beautifully captured in this video featuring his panorama drawing of New York in April 2011, commissioned by UBS. The sketch, which was featured on a 250-foot billboard, was completed in three days. Pennzoil Place is one of Houston's most unique architectural feats. Designed by Philip Johnson and John Burgee, the two trapezoid towers are only separated by a few feet, creating a unique and interesting perspective. Will the building make it into Stephen Wiltshire's drawing of Houston? What architectural icons should be included in his Houston drawing? "I defy anyone to look at his pieces and not walk away moved, touched or inspired," - Michael Vincent, a friend of Stephen Wiltshire. This work in-progress depicts the Kensington Palace Gardens in London, United Kingdom. Gorgeous photograph courtesy of The Stephen Wiltshire Gallery. #elevatehou. Texas Commerce Tower (1981, now JP Morgan Chase Tower), is Houston's tallest building at 75 stories. The skyscraper is understated and precise in composition and detail. Will the building make it into Stephen Wiltshire's drawing of Houston? What architectural gems would you like to see in his Houston panorama? Photo courtesy of 365 Things to Do in Houston. About a recent Stephen Wiltshire project: "Stephen has a unique ability to sketch entire cityscapes from memory and has created an image combining scenes from the coastal cities of Barcelona, Palma de Mallorca and Marseille. The artwork includes landmarks such as Barcelona's Sagrada Familia, Palma de Mallorca's Castillo da Bellver and Marseille's neo-Byzantine cathedral. After committing each scene to memory by carefully scanning the coastline, Stephen returned to his London studio weeks later where he sketched the panoramic view with astounding accuracy." Known around the world for his signature detailed panoramic landscapes, artist Stephen Wiltshire will make his debut visit to Houston in April to create a spectacular panorama of the Bayou City live at The Galleria. This five-day project, titled "Elevate Houston: The Big Picture," will commence on April 19 and conclude on April 23. Stephen will observe Houston via a one-time dedicated helicopter ride to study the city's iconic architecture and scenery. The following day, the artist will commence work publicly at The Galleria, spending seven hours each day sketching his 3-foot tall by 12-foot wide panorama of Houston drawn entirely from #memory. This five-day project, titled "Elevate Houston: The Big Picture" commences on April 19. Stephen will observe Houston via a one-time dedicated helicopter ride to study the city's iconic architecture and scenery. The following day, he will commence work publicly at The Galleria, spending seven hours each day sketching his 3-foot tall by 12-foot wide panorama of Houston drawn entirely from memory. Completed in 1983, the Williams Tower is adjacent to the The Galleria. This dramatic 64-story, 1.4 million-square-foot office tower is a product of the award-winning architectural team of Philip Johnson and John Burgee. This five-day project, titled Elevate Houston: The Big Picture, will commence on April 19 and conclude on April 23. Wiltshire will observe Houston via a one-time dedicated helicopter ride to study the city's iconic architecture and scenery. The following day, Wiltshire will commence work publicly at The Galleria, spending seven hours each day sketching his 3-foot tall by 12-foot wide panorama of Houston drawn entirely from memory. Artist Stephen Wiltshire found a positive way to share his exceptional memory and his ability to recall even the most minute details. Do you have something that's uniquely yours that you'd like to share with the world? Stephen Wiltshire in the news: With its impressive detail and accurate depictions, this panoramic view of three Mediterranean coastal cities is undoubtedly brilliant. But it comes even more remarkable upon the reallisation that it has been created entirely from memory - by a talented British artist.